If you haven’t been living under a rock the past 6 months, you’ll know that Windows XP end of support is April 8, 2014. Here’s a screenshot I saw on a client’s system while I was connected reviewing an issue. 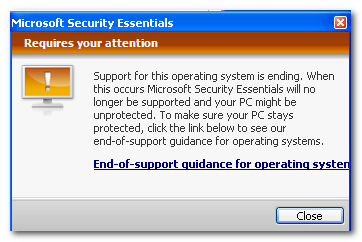 This is from Microsoft Security Essentials. This script is intended for use on Windows XP / Server 2003.